Very interested to read your thoughts on this one, Dan. I totally share your instant repulsion from the “domino” pattern on the handle scale. That’s just kind of a sad gimmick attempt to make the knife stand out. Some kind of subtler twill pattern would be preferable (I prefer the one fiber/G10 scale over all titanium). Otherwise there’s a lot to like. Your review makes me want to play around with the flipper action on one of these. About the blade shape: A lot of the Taiwan-made Spydies have wide leaf blades like the Domino & Sage or thick blade stocks like the Southard. There seems to be a meme afoot on the enthusiast sites that we’re all supposed to agree the Taichung Spydies are the best. I dunno. They have really good fit and finish but I don’t think the *designs* are as refined, time-tested, and practical as the Japanese-made Spydies such as the Caly, Endura 4, Stretch, or Delica 4. Those long, thin, FFG blade profiles that slice and pierce beautifully are a major reason why I’m a Spyderco fan for life. I don’t get the same performance yet out of the Taichung Spydies I’ve owned (Sage, Chaparral). They get sold and the Japanese Spydies, despite sometimes lesser fit & finish, stay in the collection. BTW the Moki-made Calys have fantastic F&F that I would put up against a Sage any day. TL;DR: Taichung is overrated right now and Seki City underrated, at least from a user standpoint. Thanks for stopping by, Anon, and for leaving the very insightful comment. As for the Seki City / Taichung argument I see you point and tend to agree. When I’m talking about the “best” Spydercos coming from Taiwan, I purely mean from a fit and finish perspective. From a practical and functional perspective there is a lot more room for argument and you make good points about the classic Japanese Spydies – which are undeniably uber practical knives. And for whatever it’s worth, I still think the Caly 3.5 CF is a lustworthy knife – even in the age of bearings and titanium flipper framelocks. The only thing that keeps me from pulling the trigger on the CF Caly 3.5 is that I don’t love the laminated blades on the ZDP Calys. Looks really technical and precise, but I worry the 420 outer blade would get scratched up and take away from the beautiful aesthetic of the design. Instead I have the non-laminated, 100% ZDP blades on the (Seki-made) Dragonfly and Delica FFG and they are great to use; awesome cutters. I have not had any toughness problems when using them for appropriate tasks. They convince me that the laminated blades are not needed. Always a pleasure to read & comment here. The 420 does get marred up around the pivot from just opening and closing the knife so I can understand your concern there. My dad has one and I occasionally take it out and marvel it a bit. I don’t really have it in me to carry one – mainly because my collection has plenty of other users to choose from. The design is classic Spyderco and I agree it’s among their best. Everything else is variations on that theme. Thanks again for dropping in – I’ll do my best to keep coming up with stuff for people to read and comment on. Nice Review sir…I’ve been thinking about picking this one up as well. Thank you, Jason. Worth acquiring imo – it’s a solid knife. Excellent information on the Domino. How do you feel about the lack of jimping on the flipper? Is it a deal breaker? Thanks, Maurice. Not at all, I have not noticed the absence of jimping on the flipper at all. The knife is very easy to open and your finger doesn’t get torn up. Great review! I am absolutely in love with the looks of this knife. It screams “refined Tenacious” to me. I am yet to handle one but it’s on the list. I was really surprised to see it was made in Taiwan. Just goes to show that “Made in USA” isn’t a prerequisite for making a great knife. Thanks, Matt. Yes, it’s a very nice knife. They did a sprint run of the Domino that replaces the goofy “domino” pattern with a handsome, simple carbon fiber weave with blue accents, so I bought that. It is an unbelievably well made and finished knife. As it should be for two bills — but yeah, just flawless. Silky flipper action. Perfect lockup & lock operation. The precise steel insert in the titanium lock bar makes all the difference. So far I like the XHP steel a lot. Very good edge retention but also seems to respond well to Sharpmaker touchups and stropping; not a lot of the high-vanadium-carbide “supersteel” angst with this stuff. I would now rate XHP as one of my preferred high-carbon stainlesses, along with ZDP-189, and some — but emphasis on “some” — S30V, such as Buck’s Bos-treated stuff. I don’t love Spyderco’s S30V, as mentioned in an earlier comment. There is nothing wrong with good D2. The Domino’s leaf blade is pretty broad for a medium sized knife. 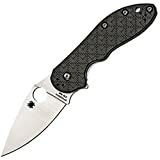 An above commenter compares to the Tenacious; that is slightly on point, but the real likeness is to Spyderco’s Manix series. The broad, slim XHP blade makes a magnificent slicer for non-fine work. The Domino will dismember cardboard with precision and ease. The blade needs to be broad to make the design work, given the handle’s compact dimensions. If the Domino had a slim Caly-like blade you could not use the Spyderhole to deploy it (or they would have to mess up the comfortable handle shape). As it is, the hole deployment is wonderful, right up there with the flipper. The Domino’s clip is the Spyderco “spoon” clip at its best. The hard-treated finish (which you described as a kind of chroming; that’s informative) is really tough. It is SO much better than the cheap, flaky black paint this clip gets on the Delica, Para 2, Stretch, and many other Spydies. I wouldn’t change a thing here. I don’t think Taichung knows how to execute the wire clip properly yet — too little retention on my Chaparral and Sage. The eyesore “Dad sweater” CF pattern on the original Domino was the knife’s only flamboyant trait. So once you take that away with the blue sprint run, you are left with an impeccable, yet rather plain knife, despite all its cutting-edge engineering touches. Some might find the Domino a little dull for $200 compared to a more “extroverted” design like the Southard or a ZT 0801. Me, I love it (in the blue CF) and had no difficulty choosing it over those two blades. I love classy, plain things, like a bespoke navy blue suit. Anon, thank you for the awesome comment and in-depth thoughts on the Domino. The Domino is my “car knife” and it still gets handled a few times a week. The “fidget factor” of this one is undeniable. I recently picked up a Chapparal (also in XHP) and that is a lovely folder. It is like a smaller Sage 1 with a thinner blade and better steel. I am becoming to really like CTS-XHP for the very reasons you mention. Enjoy your Domino in good health and thanks again for dropping by. Awesome review, Dan. I have read it more than once as I seem to keep coming back to this knife. The only issue is that I really don’t carry knives this large (I know this is not large to most knife guys, but it is for me) and even the Sage is a little bit outside of my usual size preference. This brings me to my question: have you managed to spend any time at all with the Dice? It’s just about perfect for the uses I have for a knife, size wise, and would make a nice change of pace for my D-fly and Techno. Most reviews have been favorable, but I figured it wouldn’t hurt to ask. Again, thanks for running this site (even if it does make me spend money) and for taking the time to keep us all informed and entertained. Thanks for stopping by and leaving the kind comment. Honestly, I haven’t had any experience with the Dice, but if it’s built like the Domino, then I know the build quality is very high. Based on my time with the Domino, I’d suggest checking out the Dice if you were interested in it. My guess is it’s a well made knife. I find the ergo’s on the Domino to be much better than the Sage. The Sage leaves my bottom 2 fingers hanging, while the Domino gives them a place hold on to. The main choil on the Sage is just too big, and the narrow area formed by the liner lock and scale is a hot spot. In all honesty, the thing that I really like about the Sage is the look. With my long fingers, I am not that crazy about the ergo’s on the Sage. I have a Sage 1 and used to want a Sage 2, but the Domino has satisfied my want. As for the faux carbon fiber scale on the Domino, I don’t mind it. To me it is aesthetically pleasing. The handle materials of the Domino at its price, are far better than what you will get from Benchmade, I have heard that BM forces it’s retailers to hold their prices artificially high. I have rewarded Spyderco and others with my purchases as a thank you to BM. Thanks for the thoughts on the domino. It’s a very nice knife and I agree that the long profile of it makes it feel especially good in hand. Benchmade does utilize MAAP pricing, which is a practice that is not without its share of controversy. I am with you, a lot of Benchmades seem priced outside even my reach (and that’s with a healthy budget for new knives!). How does the domino stack up against the caly 3 and the techno? (Design/blade material wise) Im quite curious between these knives(price wise quite similar in my area) and which is more towards general edc or gentlemen folders(Also whats with the titanium craze) A little backstory: I just got a Mcusta Mc 132 which sports the modified spyderhole like opening and I find it abit uncomfortable to deploy as the edge are abit too sharp for my taste so I’m wondering if the spyderhole deployment is somewhat similar experience. Also , I have a Manix (S110V) on the way to beat up with on harder tasks so the one I’m intending to get next would be more towards lighter usage perhaps. The Domino is quite fancy with the flipper given more variety for deployment.Not much experience with either ZDP 189 nor CTS-XHP in terms of edge retention,etc hopefully you could provide some insight on the matter . Any thoughts? That is a tough question, because all 3 are good knives for their own reason. I wouldn’t worry too much about the steel, as the steel is great on each of those knives. CTS XHP is a good all around performer, and ZDP-189 is an edge retention beast (tougher to sharpen, though). So I wouldn’t make the choice based on steel (personally). If you are looking for a flipper then the Domino is your only choice. That’s its main draw and the main reason to buy it. If you like the Tactility, but want something smaller and with a real Spyderhole then go with the Caly 3. That is honestly my favorite of the bunch. But the Techno is a cool little knife as well. As a lefty I liked it less, but if you are right handed it could be the perfect blend of small and stout. High speed and high class. It does have a lot going for it. I hope this helps a little – either way you are stuck with a tough decision. Hard to go wrong with any of those choices. Dan, I have long admired the Domino, I think this folder is one of the most beautiful knives in the world and I very much like the original presentation with the checked domino CF over G-10 scale. I have been made aware of a possible flaw intrinsic to the bearing system, but I cannot be sure that it truly is a flaw. It seems to me that it may be that this knife must not be adjusted by the owner because of the thin 5.5 washers that support the caged bearings will tend to cup given a over tightened adjustment. I do hear that Spyderco uses red Locktite to discourage this adjustment, and I have little issue with this if the blade is centered precisely. Have you any relevant information on this matter? Thank you in advance, Rick Davis. Hi Rick, Thanks for the insightful question. To be honest, I’m not familiar with that issue. I know that there was an issue like that on the Gayle Bradley Flipper. And Spyderco acknowledged it publicly, and fixed it. I’m not aware of them doing anything like that for the Domino, so I’m not sure if it shares that problem with the Bradley Flipper. Dan, thank you for responding, I appreciate that you took the time to respond to another “crazy knife guy”. Richard, Hah! My pleasure. Us crazy knife guys gotta stick together! One other idea is to check the Spyderco forums. They love to geek out on this sort of thing. It’s a great resource.